In 2016, I was officially appointed the Chief of Police. Over the past 32 years I have risen through the ranks of this fine agency and I could not be more honored to lead these men and women. During 2016, the Danvers Police Department hired seven new police officers. With these new hires, the police department has reached its full staffing level of 46 sworn officers for the first time since the Department suffered layoffs in 2007. Increased work force has allowed us to not only fill vacancies in Patrol, but specialty assignments, including Detectives, as well. The full complement of officers has also allowed for reductions in forced overtime and offered more flexibility in personal time off available for our officers, increasing their quality of life. I am pleased to report a 25% overall reduction in crime in 2016. This includes a 38% reduction in Crimes Against Persons, a 16% reduction in Crimes Against Property, and a 30% reduction in Crimes Against Society. The total reported crime in town was the lowest it has been in the last ten years. While crime decreased, some quality of life issues saw increases. One such increase was noted in opiate related overdoses. In 2016, the Danvers Police Department responded to more than twice as many calls for overdoses than we did in 2014. In response, this past year, officers began carrying the lifesaving drug, Narcan, for use in preventing deaths in opioid related overdoses. Every Danvers Police Officer has been trained and our officers have used this lifesaving tool in 16 incidents this year. Mental health related calls for service have also significantly increased over the past few years. This past year saw a 75% increase in these calls. Along with our in-house mental health clinician who can respond to incidents involving emotionally disturbed individuals, we have implemented a Crisis Intervention Team, comprised of dispatchers, officers, and supervisors who are specially trained in dealing with people in crisis or with mental illness. I believe the driving factor to the increase in these calls is that out officers have not only encountered more individuals with mental health related issues but they are now identifying and documenting the underlying mental health component more accurately due to their training. Looking toward 2017, I plan to expand the CIT program and anticipate that all officers, dispatchers and supervisors will receive the training in the next few years. We currently have an open Lieutenant’s position. A promotional exam was administered in the fall of 2016 and we anticipate receiving those results soon and finalizing the selection process. This will create a vacant Sergeant’s position and the promotional process for that position will begin. The construction of the new Public Safety Communication facility is underway, with an anticipated opening in July 2017. This state of the art facility will enhance the abilities of our Communication Personnel in providing the highest quality Police, Fire and EMS services for our community. The Department is also set to undergo on-site assessments for both national and state accreditation in 2017. I expect successful completion of both. In the coming year, I look forward to continuing to move this agency forward in addressing the needs of this community. 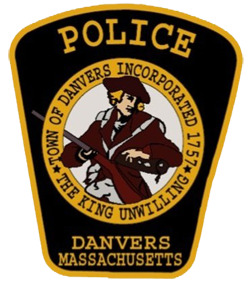 The Danvers Police Department has made the commitment to provide professional, ethical and engaging police services for all our citizens and we will strive to increase this effort.